Address: 660006 Krasnoyarsk, Karyernaya st., 26 "A"
Zapovednik Stolby, in Krasnoyarsky Krai, near the city of Krasnoyarsk was established in 1925. Its area is 47,2 thousand ha. 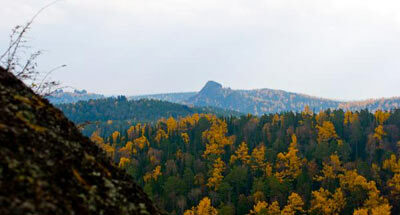 It is located on the spurs of the Eastern Sayan (Kuysumsky Mountain Range). Part of the territory, including the "stolby" themselves, i.e. 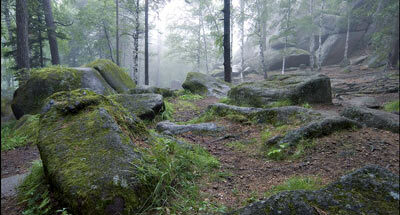 rocks of peculiar shape, about 30 groups up to 100 m high, was set aside as an excursion area. The plant cover shows well-defined altitude zones. The lover altitude zone (200-500 m above the sea level) contains light coniferous forests of pine and larch. 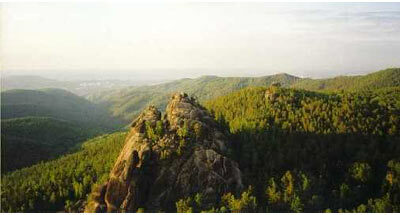 Within 500-800 m above the sea level dark coniferous forests of fir and Siberian pine are widespread. In river valleys grow spruce, spruce-fir, birch and aspen forests. On the tops of ranges and south-facing steep slopes pine forests are to be found. Near Yenisei, steppe plots occur. The flora comprises over 700 species, including relicts as the Yenisei form of Siberian lime. The animal life is typical of taiga. There are 95 mammal species. The following species are common: Siberian roe, must deer, Caspian deer, moose. Among the dwellers are: the brown bear, lynx, wolverine, sable, ermine, badger, red fox. There are 150 avian species. The common birds are the hazel grouse, capercaillie, daylight birds of prey. The rare birds include: the golden eagle, peregrine falcon, osprey. The rivers provide habitat to: the grayling, lenok, taimen, whitefish cisco. The total number of species is about 20.